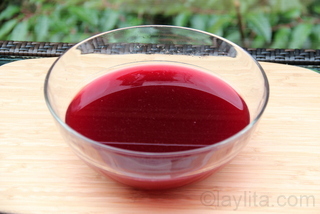 I recently made some pomegranate sorbet to use in a champagne cocktail. I used my ice cream maker to make it, but wanted to provide an alternative for those who don’t have an ice cream maker. 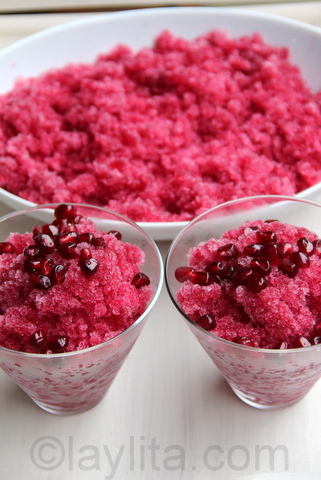 The easiest alternative was to make a pomegranate granita, which is an Italian version of shaved ice, but instead of shaving plain ice and adding flavored syrup, you freeze the juice mix and then stir it up frequently to get an icy crystal like texture. 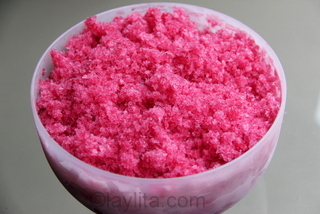 Granita is also very similar to what we call a granizado in Ecuador. 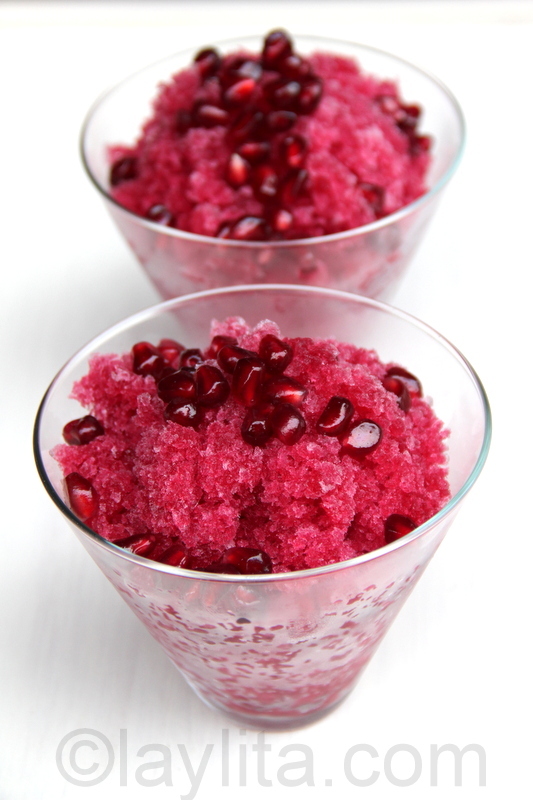 I used tequila in the original pomegranate sorbet and even for the granita it helps add a little bit of smoothness to the texture. You can add more tequila, or your choice of alcohol, for an adult version or to use in the sparkling pomegranate cocktail. 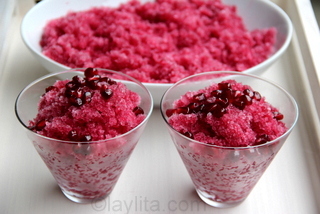 You can also omit it completely for a child friendly pomegranate granita. 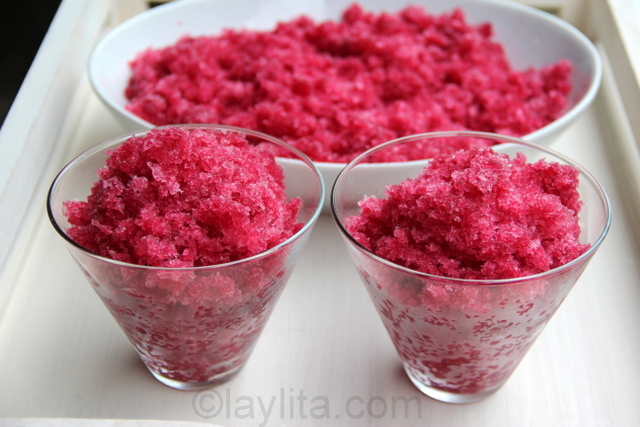 Easy recipe for homemade granita made with pomegranate juice, lime juice, simple syrup and a dash of tequila. Mix the pomegranate juice, lime juice, simple syrup and tequila. Place the mix intro a freezer friendly container. 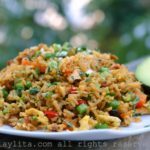 Put it in freezer for about 1 hour, then remove it and use a fork to mix it up. Put it back in the freezer and repeat an hour later, it will start to get harder so you will need to use the fork to scrape it until it has that crystal granita texture. Repeat one more time. Put it back in the freezer, before using it let it stand at room temperature for about 3-5 minutes and then use a fork to scratch it up before serving. Garnish with fresh pomegranate arils. 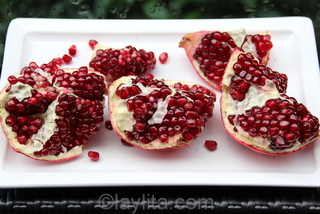 Pomegranates are such a cool fruit; they are beautiful, taste great and are also good for you. We had a few pomegranate trees on our farm in Ecuador when I was growing up. All the kids loved the, so in order to actually get one you had to pay attention to when they started to ripen, and pick the fruit before someone else beat you to it. I can still remember the taste the pomegranates that I was able to get to before the other kids; I would go sit on a big rock next to the river and enjoy the delicious juicy fruit – and the taste of victory. 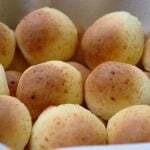 I was so mesmerized by the shiny red seeds or arils, they reminded me of precious gems, I wanted to make them last as long as possible so I would eat one aril at a time. We were recently discussing pomegranates with a friend who is originally from Iran; she also loves them and has many childhood memories related to this fruit. She explained that the way they eat them in Iran is very different than what we are used to: they squeeze/rub the fruit against a hard surface, and then they make a small hole in the fruit and immediately cover the hole with their mouth and drink the juice. You have to do this all very quickly as the juice bursts out very quickly and you might end up with a huge mess. It used to be very hard to find pomegranates in the US, but now they are widely available. Especially during the fall/winter months you can get them at most grocery stores. You could make your own juice from the fresh fruit, but it’s much easier (and cost effective) to buy the juice at the store, and it is available year-round. 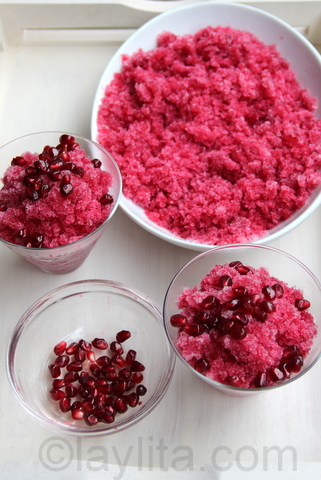 This way you can enjoy a refreshing pomegranate granita in the winter when the fruit is in season, but also during the summer months. 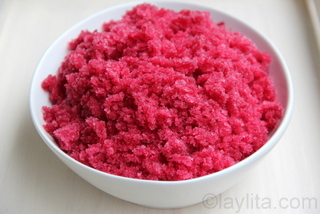 This granita is such a pleasure to the eye. Pomegranate is easily available in our country. I am sure to make it as soon as possible.